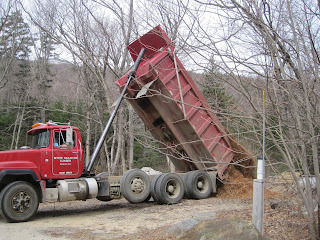 AMC Trails Blog: The life cycle of a very big pile of bark mulch: Or, welcome spring! The life cycle of a very big pile of bark mulch: Or, welcome spring! It’s here! Spring announces itself at Pinkham Notch with brightly-clothed skiers and snowboarders marching up the Tucks Trail and with moose standing in Lost Pond at precisely 5 p.m. every evening, along with the first sight of teeny tiny buds on trees. 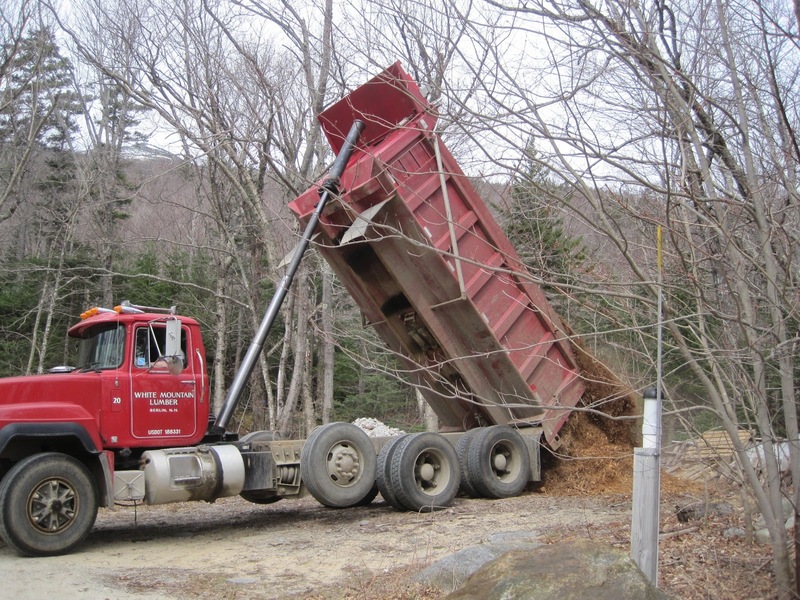 However, the true sign of spring is with the arrival of 8 tons of hardwood bark mulch to a back parking lot at Pinkham Notch. While other piles of bark mulch will be finding their way to gardens and lawns around New England, this particular pile has a very important job to do. This particular pile of mulch (sourced from a local sawmill in Berlin, NH) has the responsibility of composting of approximately 2,400 gallons of human waste. Our 14 backcountry campsites see anywhere from 14,000 to 16,000 people overnight in a given year. The busiest sites (Liberty, Garfield, and Guyot) see about 2,000 people overnight during the summercaretaker season. And, at those sites, the caretaker, armed with a pile of bark mulch and a pitchfork, will face the task of turning 300 gallons of waste into dirt every year. Our quieter sites (Ethan, Imp, Kinsman) will have 75-140 gallons to compost. Because of our White Mountain ecosystem of extremely thin topsoils and a short composting season, and the high volume we must rely on the labor and resource-consuming method that requires hardwood bark mulch. I’ll spare you the detailed scientific explanation, but if you know anything about composting, the basic concept is that you need to make the pile hot to kill the pathogens and turn the pile into dirt (or, in our case, humus). In order to achieve this in high elevation sites (eg Garfield Ridge) where it is cold, wet, and dark most of the composting season, we need to create a ‘self-insulating’ pile of compost. Thus, for every 75 gallons of human waste, we use about 300-450 pounds of hardwood bark mulch to turn it into 150 gallons of compost. 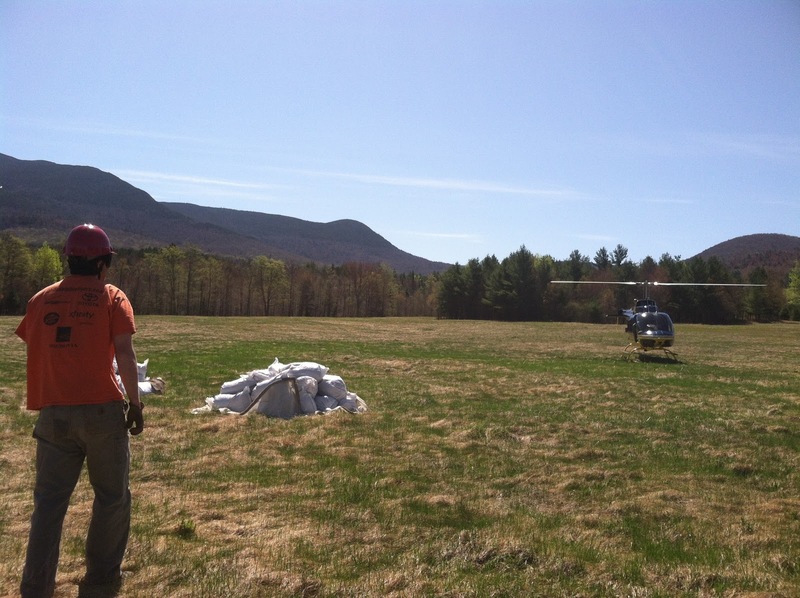 The tons of bark, having been bagged by hand into more manageable 50 pound bags, made it via helicopter to our backcountry sites on Monday, in a workday that included dozens of workers, half a dozen vehicles, and stretched from Easton all the way to the Mahoosucs. Which site received the most? Garfield Ridge, with 47 bags of bark. Which sites received none at all? Trident Col and Gentian Pond. We also airlifted about 5-6 tons of bridge material to Hancock and Wildcat, for projects that will be completed by our White Mountain Professional Trail Crew and the Camp Dodge Volunteer crews. Within the past week, that pile of mulch has gone from the lumber yard in Berlin to Pinkham Notch to bags in vans to staging areas to now sitting in bags at our backcountry sites. The bridge materials arrived and a few days later they were flown by helicopter to remote ridgelines. We like to think that these materials, the mulch and lumber, will lead a somewhat more exciting and meaningful life than some of their other kin. Also in the past week, the buds on the trees have begun to open into full-fledged leaves. Summer is on its way! The staging area in Easton, NH. Bark pictured here headed to Eliza Brook and Kinsman Pond Campsite.